Having trial lessons arranged and scheduled for me was very convenient since I didn't have to arrange everything by myself. 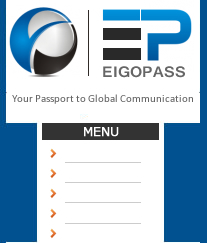 When a problem occurred regarding a cancellation issue, EigoPass was fast in resolving it. Created by teachers for teachers: EigoPass.com was founded by a group of teachers who were tired of the tarnished image "eikaiwa" teachers have gotten in Japan. Teaching is a profession that requires more than just being a native speaker of the English language. It is a skill that requires dedication, commitment, and most of all, the motivation to help students master their goals. Our commitment to work with and listen to our teachers underscores the fundamental beliefs of our company mission. We at Eigopass.com truly understand that teachers are the backbone of our company. Therefore, we are driven by one simple objective: To function as an organization unlike other English organizations in Japan. An organization that functions as a school deeply committed to the development of our students and teachers, and not as a "business" like the larger English corporations only focused on profits. We promise to never under-value or take for granted your skills, talents, and ambitions because you are in essence a part of us. We understand your importance to our organization, which is why we will continually work with you to help facilitate your career and success in Japan.